Five years ago I wrote the first post. Five years ago I still lived at home with my parents, in the attic at the top of the kitchen stairs, there was still Kira around, proudly guarding the garden from the balcony, I had an office job that probably I still used to appreciate, even thought it was already was a bit tight. I used to cook in his spare time, stealing space, spices and pots from mum in the kitchen, I had bought only three cookbooks, two written by Tessa Kiros and one by Jamie Oliver. I had a few trusted friends, the ones that are still here every day, and an endless list of dreams. Five years ago my life changed, I’m not exaggerating. Now I feel like I am fully living my days, often with shortness of breath, running behind my schedule, but firmly believing in an ideal life which I try to turn every day into reality. Have I succeeded? Not always, I admit it, but it’s fun to try and set yourself a goal, higher every time. I am not able yet to get up early every morning, bake home-made sourdough bread, pick up vegetables from my well organized garden and cook them, write inspired looking out of the window on my Tuscan hills. I get up late every day, emerging from my blankets as after a hundred year sleep, because every day I work till late in the evening on the computer or maybe I go out (well, I’ve conquered a social life again in these five years, let’s celebrate), I have breakfast while I check my inbox, though I am regularly late in answering your lovely emails and I feel guilty for all the emails I’ve still here, waiting for an answer. I cook often in my pajamas, I take pictures badly balanced on a chair, I play with Noa and I try to keep her away from the food, sometimes I succeed, sometimes I don’t… The sourdough bread is often rather thick, not to say hard, the large bubbles in the crumb are still my wildest dream and I am still able, during the most important dinners, those with him, to burn the potatoes or make an inedible pizza. Thankfully a good chocolate dessert always comes to save the situation. Routine. In these five years I have learnt that we should not be ashamed of the desire to be happy. It might be a banal word, happy, something pronounced by a little girl with pigtails, and yet it is still a word that scares people to death. People will work against you if you believe in a world where happiness is a choice and a possibility, and they don’t. It won’t be happy every day, every minute, but you can try to be so unashamedly happy. And that’s what I’ve been doing for five years, believing in myself and in what I do. Would I make it all again? Yes, undoubtedly yes, choice after choice, sleepless night after sleepless night, pound after pound, despite the disappointments, the missteps, the falls and the mending diets. Since I decided to give voice, colour and flavour to my projects I have finally become myself. This is one of the most amazing gifts that my blog gave me, along with new friends, exciting travels, a new job built day after day, two books, a prize as best foodblogger 2013 and a special person. 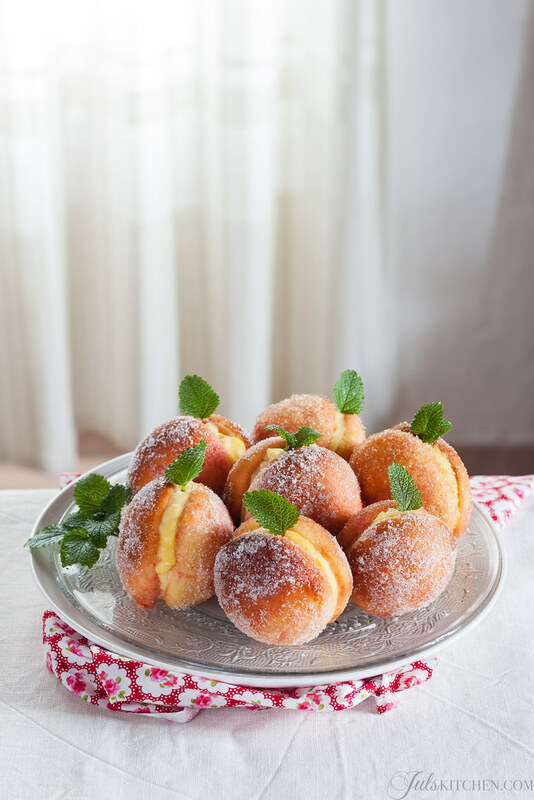 And now let’s celebrate with a recipe that brings me back directly to my childhood summer birthdays, a special Tuscan sweet brioche known as Pesche di Prato, literally peaches of Prato. I didn’t know they belonged to Prato, a big town close to Florence, until recently, when I started to chase the perfect recipe, because during my childhood for me those were just grandma’s pesche. They were her specialty along with bigné, there was no birthday without a tray of pesche. These so called pesche are domes of brioche, soaked in alchermes, the bright pink liqueur that gives to these sweet treat a romantic antique rose hue, a must in most traditional Tuscan pastries. 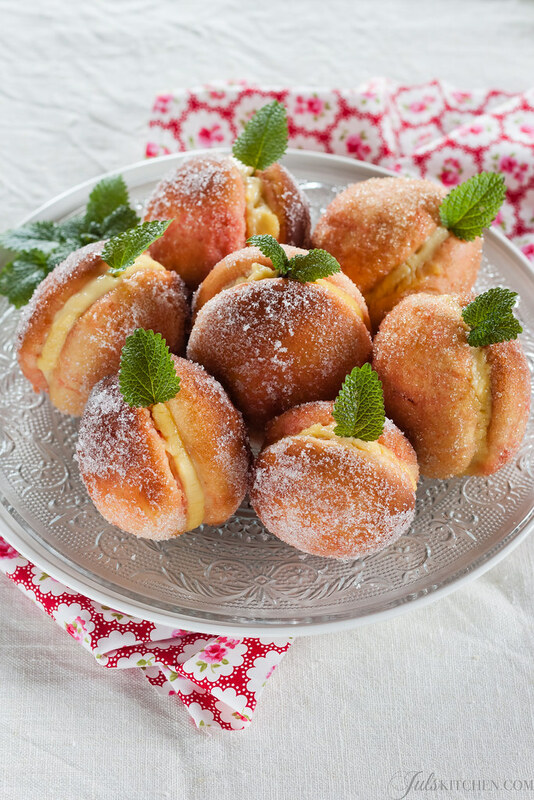 The brioche domes are paired two by two, held together by a thick Italian custard, then they are covered with caster sugar, to mimic the velvety skin of one of the most delicious summer fruits. They are not difficult to make, you just need some organization. Brioches and custard are unspeakably good by themselves, but when the alchermes comes in, they become something unique, so unique that dad tasted them, then said, serious, looking into my eyes: these are good, you have to make them again. 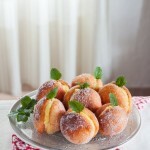 They taste like an old-fashioned dessert, the kind of sweet treat that would cover your lips with a layer of sparkling sugar, lightly soaked with liqueur, yet not too strong not to be appreciated by children, just enough to turn them into a forbidden pleasure, granted just on special occasions. And today is a special occasion for many reasons, so I want to give you a gift, a peach, a smile covered with sugar and the recipe to make this special treat, found on CookAround. Will you celebrate with me? Put all the ingredients except the butter in a stand mixer bowl and knead until you get a smooth dough. Add the butter and knead until completely blended. The dough will be quite soft. Let the dough rise for two hours in a warm place, as inside the oven with the light on. The dough should triple. After the needed time to let them rise, form small balls of dough, using a spoon to make it easier and dusting your hands with flour. You'll have about thirty balls. Put them well separated in a pan greased with butter or lined with parchment paper and after a couple of minutes flatten them slightly with your hands. Let the dough rise again for two hours, it should triple again. Heat oven to 200°C and bake the brioches for about 15 minutes, until honey-coloured. Warm in a saucepan the cream and the milk with the lemon zest, vanilla extract and 70 g of sugar and bring to the boiling point, then remove form the heat. In another saucepan mix the flour, the rice starch and the remaining sugar. Pour in a spoonful of milk and stir with a whisk. Add the eggs, whisk again, then add the rest of the hot milk. Put back the saucepan on the low flame and whisk constantly until thickened. Put it in a water bath of water and ice so that it will cool down quickly. Heat the water and sugar, when the sugar is completely dissolved add the alchermes and remove from the heat. Make a well in each brioche on the flat side, using a teaspoon, then dip them in the syrup and fill each brioche with custard. Be generous! Combine the brioches, two by two, to form a peach, then roll them in granulated sugar and decorate them with a leaf of fresh mint or lemon balm. I am so happy for you! 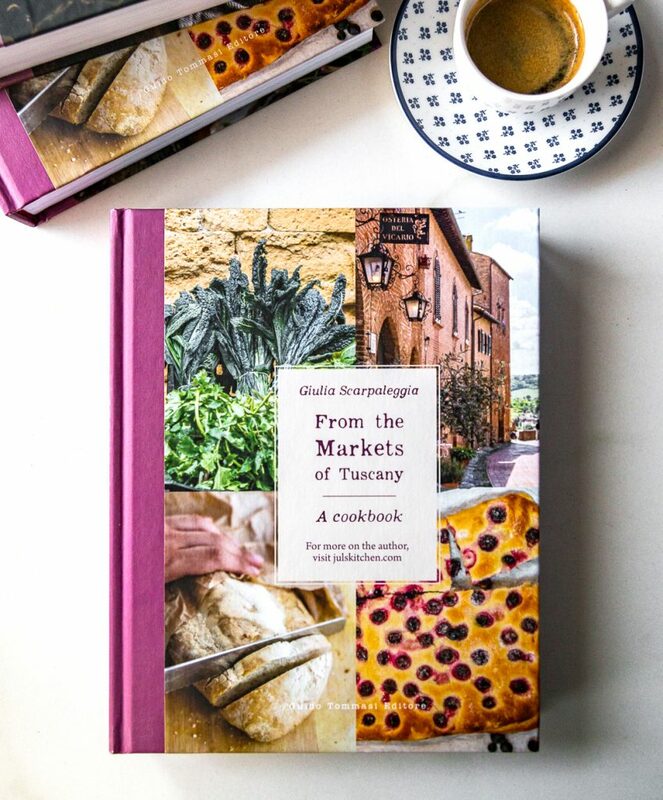 I have been following your posts for a couple of years after discovering your first cookbook in a dress shop while on holiday in Tuscany. I planned to buy it when I had less to carry. Unfortunately I was not able to return to the shop. I emailed you and you told me your first book was not available in Canada. I was, however, able to get your second book which I gave to my son who was a sous chef at the time. I follow you on Instagram too. Is your first book available in Canada yet? Recipes from my Nonna. I wish you continuing success and good luck always. I have always loved these peach pastries and have looked without success for a recipe. Thanks. I will let you know how they turn out. “I have learnt that we should not be ashamed of the desire to be happy.” So true! Congratulations on five years of fulfilling blogging. Here’s to a future that’s even more happier and brighter!! Congratulations Giulia!!! five years! That is quite something!! These little treats look gorgeously romantic! So so pretty. These five years have been an amazing journey I’m sure! Many congratulations to you for living your dream to become your true and best self. Thanks for sharing your happy thoughts about the positive outcomes you are experiencing. Keep up the good blog work! Congrats on 5 years! That is quite the accomplishment. This is a beautiful post, it looks so amazing! I wanted to let you know that over the last few days I have gone through your ENTIRE blog after I found it! I just couldn’t stop and I am so excited to try many of your recipes! Congratulations. Happy Anniversary and to many more! I love your blog and bubbly personality. Keep up with the great work and dream on. Those pesche di prato are splendid. I just love your blog, Guilia. Your photos are stunning and your recipes make me want to live in Italy. I’m always so excited when I see you have a new post out. I love to have a cup of tea and read it and imagine I am in Tuscany again. Congratulations on your anniversary! I have just discovered your blog, and started to follow it…can’t wait to looking forward to hearing all about your adventures to come. Having just started my own blogging adventure, it’s lovely to hear yours has brought such happiness to your life… Cheers! Complimenti ed in bocca al lupo per i tuoi progetti. Ma perchè, visto che sei italiana ed abiti in Italia, scrivi il tuo blog in inglese? Me lo sono sempre chiesta. Ciao. Congratulations!!! THis is just so exciting and wonderful. Looking forward to what the next 5 years have in store for you! lovely, lovely peaches…! stunning. do you tint them with anything…? they look so, well, peachy colored! will have to try them, asap. I didn’t think these were made with regular Brewer’s yeast. I’ve never gotten a straight answer regarding it being a yeast or baking powder. there are various version, some are made just with baking powder, some with brewer’s yeast. I think Lievito Pane Degli Angeli is a baking powder, or at least it is a baking powder in Italy! If i don’t have alchermes, what kind of wine can substitute? Hello! I’d rather use coffee or a fruit syrup, otherwise you can substitute it with a sweet wine, sherry for example! Yes, but I am not sure about the exact dose. If it is dry brewer’s yeast you can use 1/3 of the requested amount!